In 1886, Charles G. Willson purchased five acres west of the town of Rockville, hired an architect, and began to build a large, four-story brick "summer boarding house." Before the building was completed, Willson filed for bankruptcy. Among those looking at the building were the Trustees of the Rockville Academy. The unfinished hotel and adjoining three acres were bought for $6,000 by Mary J. Colley, proprietress of the Clarendon Hotel in Washington, D.C., and her partner Charles W. Bell. When the Woodlawn Hotel opened for business in the spring of 1889, it was an immediate success. Summer guests, many of whom were prominent D.C. residents, enjoyed social gatherings, musical soirees, card games, dances, walks among the trees and cool country breezes. Ads for the Woodlawn boasted electric bells, gas lighting, artesian water, fresh country vegetables, breezy porches, and 40 guest rooms. Visitors usually came by train, traveling the mile from the railroad station to the hotel by carriage. Rockville's "boom" continued into 20th century, until a series of depressions deflated the economy. Many summer boarders, such as Edwin and Lucy Smith, decided to build year-round residences on lots in new subdivisions opening around Rockville. They liked living in a small town convenient to federal government jobs in Washington. However, by 1906, the Woodlawn's owners, heavily in debt, had to sell. The hotel, stable, windmill, ice house, carriage house, laundry and servants quarters, and eight acres went to public auction. The hotel was purchased by Dr. Ernest L. Bullard, a surgeon and professor of psychiatry and neurology from Milwaukee, Wisconsin. Dr. Bullard renovated the hotel, by that time at the end of the trolley line. 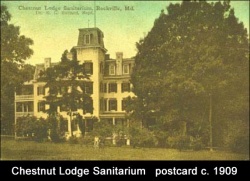 In 1910, he opened a sanitarium for the care of nervous and mental diseases, naming it for the 125 chestnut trees on the property. For many years, Dr. Bullard was the sole physician. For more than 75 years, three generations of Bullards operated Chestnut Lodge. The private hospital became known nationally for the quality of care and treatment, based upon the Bullards' philosophy that mental illness is treatable through a combination of psychoanalysis and occupational therapy. Well-known therapists, such as Frieda Fromm-Reichmann and Otto Will, joined the staff. Through the years, the Bullards added acreage and buildings to their property, and made their home at Rose Hill. By 1997, Rockville had changed and so had the Bullard family. CPC Health, a nonprofit corporation, purchased the portion of Chestnut Lodge facing West Montgomery Avenue, but declared bankruptcy three years later. In 2001 it was purchased by the Washington Waldorf School (a small private K-12 school in Bethesda). In late 2003, real estate development firm Chase Communities purchased the property. It planned to build 43 single-family homes on the property prior to renovating the main building to accommodate seven luxury condominiums. In February of 2006 the Rockville City Council voted to approve a Bethesda developer's plans to transform the grounds into 43 houses and condominiums worth at least $1 million each. Morton H. Levine's $45 million project has been widely supported in the community — a rarity these days — largely because residents say the developer convinced them that he would revive one of Rockville's most charming properties while respecting its past. Under Levine's plans, the property's main building will be restored to its former grandeur and house seven luxury condos. Two cottages, an ice house and an old red barn are also being restored. The rest of the property will be dotted with 36 Victorian-style homes, some with elevators. While the developer won battles to demolish an old, dilapidated nurses' residence and to forgo building a large park on the property, he must build an emergency access road that could be later turned into a street connecting the property with the nearby Rose Hill Community. Many Rose Hill residents argued vehemently against the road, fearing it would become a cut-through. Language in the approval documents stipulates that the Chestnut and Rose Hill homeowners associations would have to approve turning the road into a regular thoroughfare. Levine's plan will go to the Planning Commission, which will work out the nitty-gritty details of engineering, sewage and storm water management. On June 7, 2009 a fire destroyed the original hotel/sanatorium building. This page was last edited on 1 January 2018, at 14:26.